I love getting mail! I remember growing up in Tanzania and getting so excited every time I got a letter. I learned early on that the best way to get mail was to write letters. Why? Because people will write you back. Well, it's similar here! 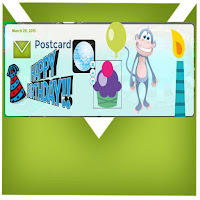 As a Lightglider, you can create Postcards and send them to your friends. There are tons of stickers and phrases to use. And there are new ones to buy in the shop! It is so fun to make postcards and send them out to other Lightgliders! And, of course, it's fun to get postcards too. You can keep track of the ones you give and the ones you get on your Timeline in Glidebook. Remember -- it is more blessed to give than to receive! I love getting mail. Do I get a real postcard in the mail? There are so many stickers to work with! Looks like Boots from Dora..